JavaPowUpload is a web browser applet -File Uploader and File Downloader. Uploader has been created to replace the classic Form uploading in a browser. JavaPowUpload can work at 99% of browsers and sites. It supports IE, Firefox, Opera, Safari, etc. Most users has Java installed (the quantity of such users is growing), also JRE can be easily downloaded and installed automatically within 1-2 minutes. It is suitable for any OS installed on a client’s computer or a server. JavaPowUpload supports any server script that uploads files: PHP, ASP.NET, Perl and others. For JavaPowUpload you need only Java Runtime Environment (JRE) installed. JavaPowUpload can be used on any website and adapted by a webmaster without any programming skills. Any company that wants to offer comfortable uploading and downloading of multiple files, folders and images may use JavaPowUpload. It is not necessary for website visitors to install extra software like FTP client or download manager. Most of the problems connected with uploading and downloading can be solved by JavaPowUpload that can be adapted by a webmaster. Selecting multiple files for uploading by Ctrl, Shift or by Ctrl+A hot key. Selecting multiple folders (including subdirectories) for uploading. Resumable upload if Internet connection was broken. Very large files upload (10 GB tested). 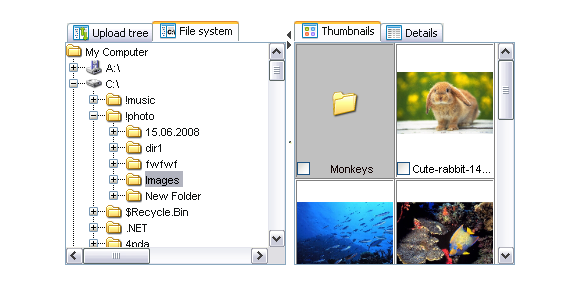 Image preview in JavaPowUpload interface. Manipulations with thumbnails: rotating, cutting and resizing. Thumbnail uploading on server after the manipulations. It increases the uploading speed and saves from doing the manipulations on server side. Themes support. 45 themes included. Progress bar and detailed information about the uploading process. Upload and Download in one component of one style. It is possible to set a restriction on types of uploaded files and their quantity, for examples, to upload only images. It is possible to set a maximum size of particular files, all files or to set a quantity of files. JavaPowUpload uses standard RFC1867 for uploading. The same standard is used for uploading via standard Form. Supports uploading and downloading via HTTP, SSL/HTTPS, FTP, FTPS. Supports Authentication (Forms, Basic, Windows integrated). Supports Cookies and Session. JavaPowUpload automaticaly sends all Cookies and SessionID cookie that has web page containing it. Supports Proxy Servers. Proxy server settings should be configured inside JavaPowUpload. Didn't found needed features? See our advanced relayted products: Flash based MultiPowUpload , Silverlight based Ultimate Uploader , ActiveX ActiveXPowUpload.